physics colloquia and other findings. It's always nice to be back on campus and this time we found ourselves having to maneuver through a forest of student backpacks that were placed on the lawn, representing the students who would have used the backpacks, but instead who were no longer living. 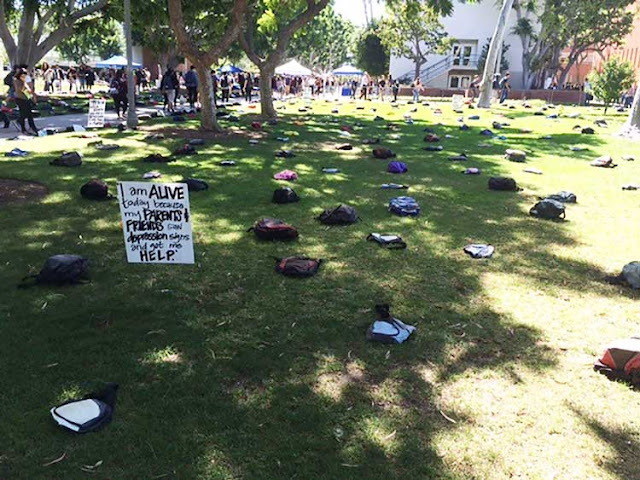 The awareness group, Send Silence Packing, sponsored the event to draw attention to the high number of students who commit suicide. It was quite a moving moment to walk through the backpacks and read little notes and synopsis of a letter or diary of some student who committed suicide and was not any longer there. The group was trying to draw attention that suicides often indicate many times that they are troubled and that if those hearing their woes would just have taken more action many of these suicides could have been prevented. The event had booths and flyers available identifying where troubled students or those knowing of some concerns could find counselling or other services. I found this demonstration very moving, especially since suicide is the second leading cause of death among college students, many of which could have been prevented if only they could have got through the rough times they were currently experiencing and recognized there were other solutions for their troubles. At CSULB we have to walk right through the main quad from the colloquia to lunch so we get to see what is going on. I remember when I was an actual student many years ago, the protests were against the Vietnam war, even though as an engineering student, at a different school, and the engineering building was located near the edge of the campus, I hardly knew anything about the protests other than what I read about in the newspaper. Anyway. back to the physics colloquia, this time featured a presentation by Professor Xu from UCSB, talking about the physics of topological insulators, which is an entirely quantum mechanical type of phenomenon. I got thoroughly lost after about 15 minutes, but the first portion of the lecture was very interesting. he talked about how the states of matter (solid, liquid and gas) and the phase changes between these states are caused by a competition between energy and entropy. For instance, consider something like the Gibbs free energy, F = E -TS, where E represents the internal energy, T is the temperature and S is the amount of entropy. As we cool the material, it can go through phase changes from gas, to liquid, and finally to solid as the temperature is reduced, which means that the E term begins to dominate the equation because T becomes lower and lower and the effects of entropy decrease as a result. Now you might thing that as T approaches absolute zero, that the material will be in minimal energy state, E. But, no, because it is then that the quantum mechanical effects, described by the uncertainty principle begin to become more and more important to describe the state of the material, so now we have quantum mechanical uncertainty instead of just good old classical randomness and entropy. Anyway, beyond that I got lost as he described how these effects were being observed and the quantum mechanical predictions confirmed to exquisite detail using graphene sheets. I'll have to look more into this topic and if you are interested you can check out other solid state and condensed mater physics courses and textbooks. Boy, more work! As long as we are talking about physics, we might as well report on some of the follow up study I did following the September 16 post, which covered the AIAA conference where the use of gamma ray spectrometers were used from Martian orbit to explore what materials the Martian surface contained. I wondered there how it was possible to use gamma rays for such remote sensing of the surface? We could begin by examining the nature of the gamma ray measurements made by the Maven spacecraft in orbit around Mars, but my initial look at this topic started with the science of gamma ray spectroscopy and I used a great textbook, "Practical Gamma-ray Spectrometry" by Gordon Gilmore. The book outlined the physics behind the absorption of gamma-rays in detectors and the many physical mechanisms involved including pair-production, Compton scattering and electron excitation and how the total energy of the gamma-ray photon tends to be totally absorbed in good detector designs and shows up as an electrical pulse whose amplitude is proportional to the total photon energy. The time scales for these processes are in nano-seconds and integrated pulse widths in microseconds. The statistics of counting pulses and determining the intensity vs. energy (or wavelength for photons) is a key factor in setting detector design and resolution. Then if the number and distribution of all received photons and corresponding pulses is summed up, then a complete spectrum of gamma-ray intensity vs. energy is developed. This received spectrum is then compared to the known nuclear processes that result from gamma-ray production in the nucleus and each spectrum is associated with one particular atomic element. The generated photons can travel long distances from the Martian surface, for example, and are un-deflected by magnetic or electrical forces and move in straight lines to the satellite in orbit. There are many other theoretical details which will not be discussed here other than just to note that this makes possible the remote sensing of elements in the Martian soil from orbit. The "gamma-ray telescope" must be well shielded so that the other sources of gamma-rays are not misinterpreted as coming from a line of sight to the surface. Just like for optical telescopes, the gamma-ray telescope must be shielded from these other gamma-ray noise sources. Then the orbiting detector can just scan across the surface and collect data point spectrums that indicate which elements are present at that scanned location. Another of the offsite activities was attendance at the 3-day Energy Storage conference in San Diego. My interest in this topic goes back to my working in energy engineering and a recognition that more effective energy storage is going to be required for electric utility systems to incorporate more variable and intermittent solar and wind power system and ensure the entire grid system remains stable. 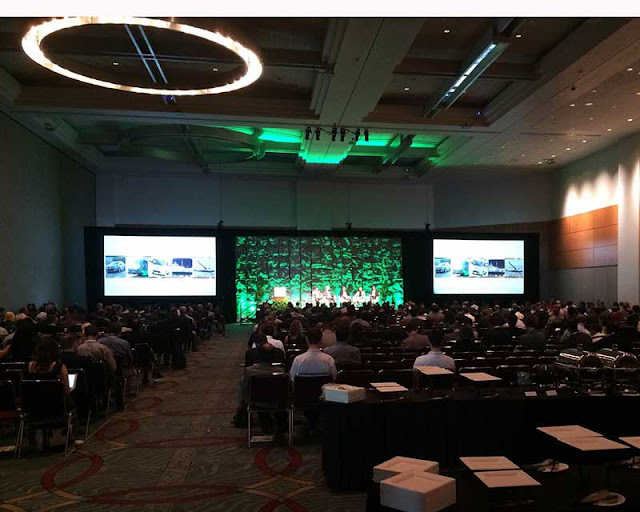 The conference was well attended by over 1000 folks, many of whom were international attendees from China, Turkey, Mexico, Germany, Italy and the UK. See photo below of one of the plenary sessions. A worldwide market for energy storage is developing as users begin to build compelling cases for introducing storage into their electrical systems. Utilities use energy storage to defer substation upgrades or transmission line upgrades and commercial and industrial users install storage to shave peak charges from their utility bills. The major problem faced by these installers is finding enough income savings to justify the cost of installation, and as utilities find more how they benefit by customer installed systems, the utilities themselves begin to price those values and reimburse customers who install such systems. Finding all of these additional income streams is the major problem. 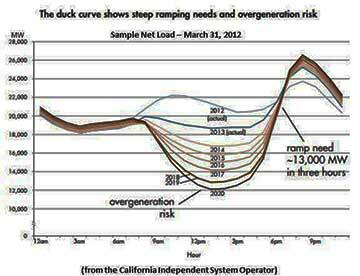 Of course, major cost reductions and technical breakthroughs are still needed. 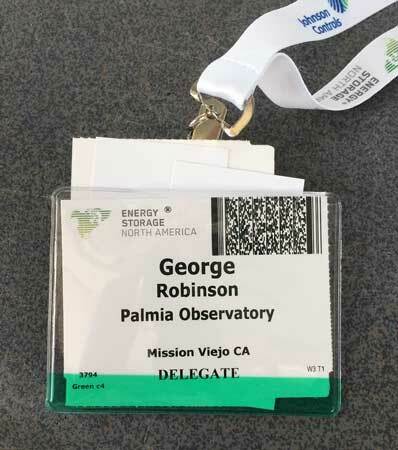 Now, I showed up as the Resident Astronomer at Palmia Observatory, at least that is what my badge listed me as, so I guess its official now. See photo below. Yep, its official, that's what the badge says, so it must be true! Many folks that I encountered were a little confused because they couldn't quite see why an observatory would be interested in energy storage, UPS systems maybe, but not utility energy storage systems. Anyway, it was a lot of fun and gave me a chance to talk about astronomy and my previous work in power conversion systems and that while the observatory does not have a dome, it does have a couple of resident astronomers and astronomer assistants and telescopes, and the name itself is really just code for 'retired" amateur. I especially enjoyed bumping into Retired, Digital Hardware Design Manager, Ko, who shared some of my interests in just checking out how the technology and applications were developing. Thank you, Ko! I was glad and excited to see that some progress is being made in the growing recognition of the need for energy storage, even though the growth of installed systems seems to be still just around the corner. Some good new I heard was that when our local utility SCE went out to procure 50 MW of mandated energy storage, they found that acquiring over 260 MW of storage could be justified to the full benefit of all of its rate payers. This was great news in that the recognition of the value and need for energy storage to enable entry of more solar and wind power is happening. Another regulatory issue was discussed that also greatly encourages utilities to add energy storage as the more cost effective way of increasing the reliability of the utility grid. During the recent 2011 blackout in San Diego, many of the other interconnected utilities were fined because they did not have enough redundancy themselves to help support the grid during the emergency and adding energy storage is again found to often be the most cost effective solution. It was also interesting to hear that the market value of the top four US coal companies has collapsed by about 99%, with stock market value now only about 1% of what it was just several years ago. This is a sad fact for all of the employees who will be laid off and need to find other jobs, but the demand for coal is in a steep decline due to regulation and CO2 reduction goals and the growing amount of solar and wind power. As a recipient of a pension earned by my many years working in Big Oil, I know that each of us has a financial stake in the status quo, we still have to recognize the science and make the right decision to begin moving away from fossil fuels. One of my favorite events was to walk the exhibit floor where about 100 vendors had their booths set up and just see what was going on and what products were being offered. But since I am no longer directly involved with evaluating or specifying or developing these types of systems, I was much more interested in what little tradeshow goodies were being given away. My favorites were little chocolate balls and bars and I got even one energy power bar for recharging your cell phone. Wow, now I really know how to work the show! Finally, let's return to the amateur astronomy topic of trying to capture images of some of the asteroids. So far, I have taken images (well just a half dozen pixels really) of two asteroids, and I can identify them because the asteroids are well known and have predicted positions that I use to actually find and identify the little white blobs of light as a particular asteroid or whatever. The real issue is how do amateur observers, who actually find new, non-identified objects, that later are deemed to be asteroids, actually find the objects that are in our solar system and therefore move around with respect to the background stars? I meant to complete this whole analysis task this week, but, hey, I just got back from driving up from San Diego, and I was tired and just couldn't get it all done. Part of the complication was that I knew that Ceres would still be below the rooftops by about 10:00pm and when I went out to setup about 10:00pm, I found that Mars was just slipping below the rooftops and I wouldn't be able to do a one planet alignment. So, I had to wait about another hour until two other bright stars, Vega and Altair, were low enough to be good alignment stars. Then when I slewed to Ceres location and took a couple of images, I was not able to slew back to a known reference star. Since the scope did not slew back to the right position, I doubted whether my image of Ceres was right on or not. So, to check things out, I brought the camera back inside, downloaded he image, uploaded the image to astrometry.net and sure enough, discovered that the mount was pointing about 10 degrees high and missed Ceres completely. Wow, what is going on? So, I reset the mount, erased any previous alignment data and did another complete alignment. This time when I slewed the mount to point at Ceres and took a couple of images, I slewed the scope back to another couple of reference stars, in this case Capella and Aldeberan. 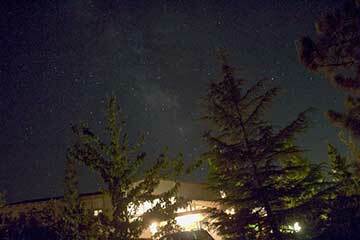 This time the mount slewed exactly to where these stars were centered right in the camera field of view. 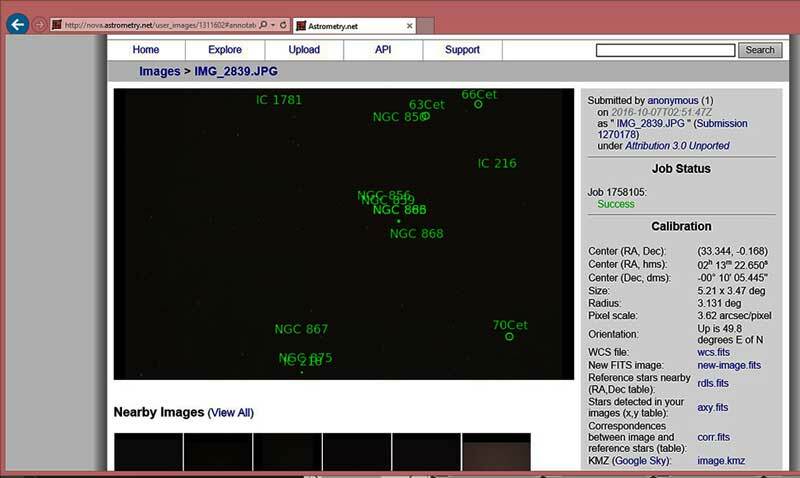 So, I was quite happy and with this quality assurance completed, brought everything back inside and uploaded the image to astrometry.net and sure enough found the image was pointing just very close to where it was supposed to point. See the screenshot below. Not bad for a single star alignment. The center of the frame was within a minute of RA and 16 arc minutes of declination of the predicted location of Ceres and since the camera field of view was 5.2 degrees by 3.47 degrees, Ceres had to be there. So, with this current image and the image taken about a week ago, I now have two images to try out and get that darn blinking software to work and find out once and for all whether I can locate a dim object, such as an asteroid, that moves and changes location against the background stars. I'm worn out now and will try this later. Its funny though, I kind of like the sound of that sentence, "... get that darn blinking software to work..."